This craft was inspired by a trip to the beach, where we had collected some beautifully gnarled driftwood, shells, tiny crab claws, and some overgrown brush. I'd also had some leftover bits of yarn and twine from another crafting project and was looking for a use for it all. This is a great craft to do as part of a coven dinner especially because you can all bring your own sticks & elements from the natural world to use and share, and it's highly customizable so you can each put your own creative spin on it. One of my favorite things about crafting in circes with other women is seeing how some of the same materials can yield such different results all depending on the creative energy channeled. 1. Cut your cotton twine to your desired length. Each piece should be doubled over so that you can cast on to the wood, as in the picture above. 2. Cast the twine onto the wood by forming a loop over the wood and pulling the two ends of the twine through the loop so that you have evenly spaced out warp threads. 3. Begin threading your yarn through the warp threads in an over-under-over-under pattern. The first few rows will require patience but as you go you will train the threads to stay in place little by little. It's necessary to work on a table, the floor or on a flat surface. 4. 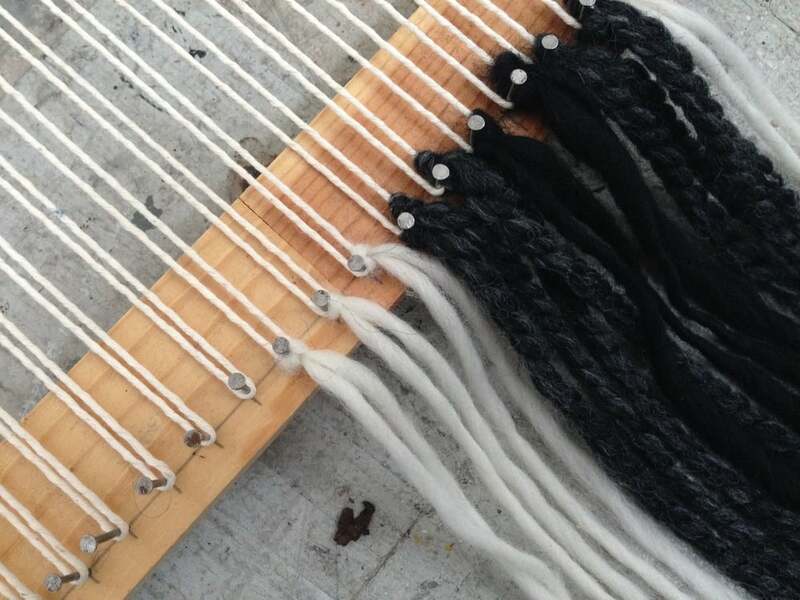 Once you're finished with the first color or type of yarn, to switch it up, leave off your threads on the underside of the weaving, and introduce your new threads where you left off. If you want it to look more raw, you can leave the ends poking out on each side as with the twine in the above picture. 5. Keep threading, switching out the yarn and string as desired, until the entire weaving is done, tucking in your natural elements and weaving them through with your weft threads. 6. Tie a piece of yarn or twine or clothesline to either end of the wood so you have a loop to hand it on, and you're all done! Enjoy your work and hang it on the wall. 1. 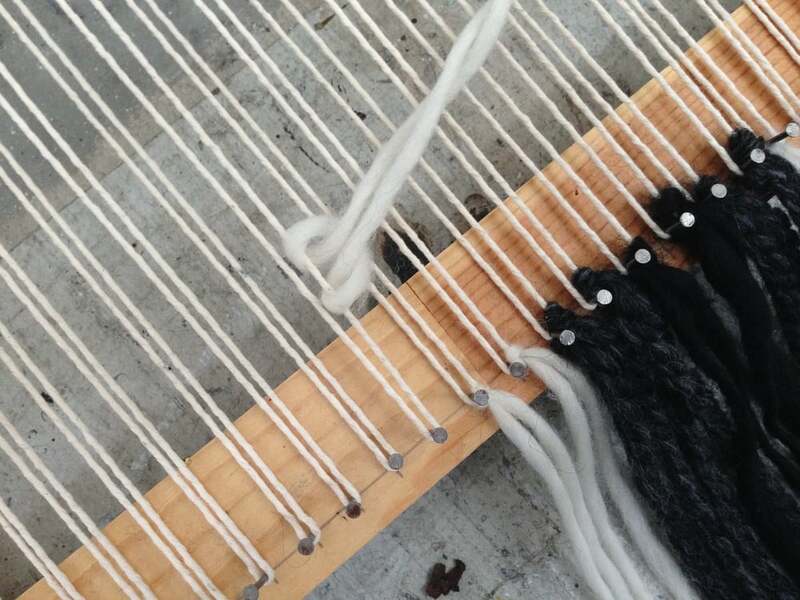 String your cotton twine along each of the nails, making sure to leave a wide enough loop on each end when you tie it off so that you can eventually get the weaving off from the loom. 2. Cast on your tails. 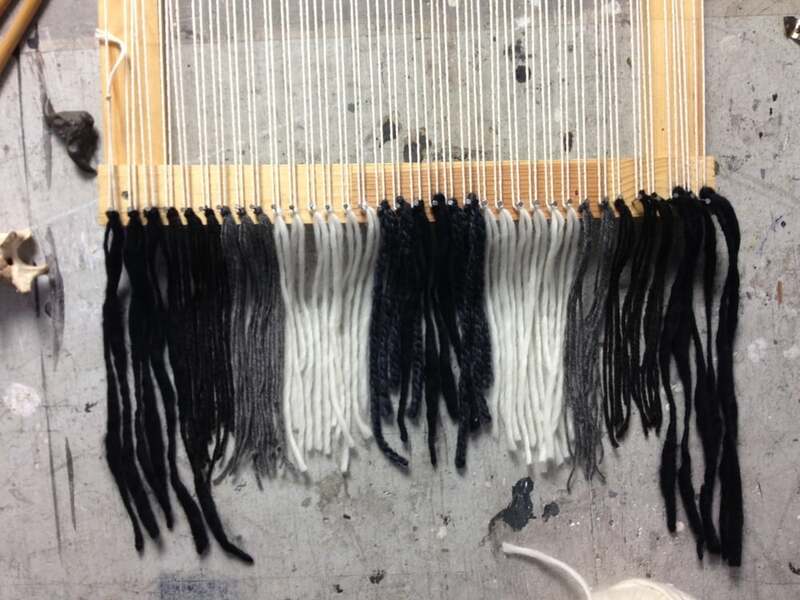 This part is necessary since the weft will need some finishing off at the bottom - otherwise you'll be left with raw loops. Do this by looping a doubled over piece of yarn through only one string on each nail, then pulling it tight and pulling it down to the bottom, beneath the nail. Repeat this in whatever color pattern you desire until you're left with the full row finished off. 3. Mark off any patterns you want to make in your weaving by using a pencil or marker directly on the warp threads. 4. Begin weaving, from the bottom up. I didn't have an embroidery needle, so I used an old beer opener and threaded my yarn through that. Get creative. You'll want to do an over-under technique and work your way up. Again, when changing yarn types or colors, leave a tail in the back of the weaving, of the color you're leaving off, and then begin threading with the new yarn, leaving a 3 inch tail in the beginning of that one. 5. Keep weaving, as you go switching the colors and yarn types as you see fit. Weave around your markings so you can fill them in later. To do this, you need to keep weaving back and forth when you reach your pattern marking, as opposed to all the way across. 6. Fill in the spaces you left open with your color of choice. 7. To finish off your wall hanging, remove it from the loom, and group together the loops at the top, tying them off and threading them onto your wooden stick.